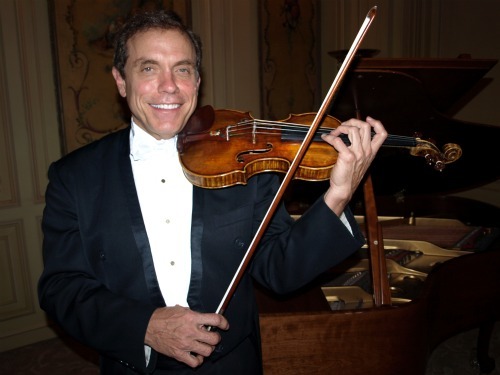 Violinist Eugene Fodor died Saturday in Fairfax, Va., at the age of 60, after an illness (liver disease) that had started in June, said his sister, Deborah Fodor-Bode. It is impossible for me to write about the death of Eugene Fodor without personal attachment. In my very early violin days, a family friend gave me a gift: a cassette recording of Eugene Fodor playing the Tchaikovsky violin concerto. I was nine, and it was the first recording I owned. It was the only classical music recording in the house, and I loved it with abandon. Fodor grew up in Colorado, as did I. He won the 1972 Paganini Competition and received the top prize in the the Tchaikovsky Competition in 1974, just a few years before that recording was made. It was a source of national and local pride that an American – a Coloradan – had won a major Soviet honor, in Moscow, at the height of the Cold War. In fact it was a source of controversy that he was given only the “top prize” and not declared the “winner,” sharing the honor with a Russian. A chorus of those present testified that he had indisputably played the best. Though Fodor was universally admired for his awe-inspiring violin technique, even his closest friends described him as difficult and irascible, his problems with substance abuse never completely at bay. In 1989 the New York Times wrote a scathing headline that read like a career epitaph, just a week after an arrest for drug possession, From Tchaikovsky to Heroin, a Brilliant Violinist's Decline. But Fodor also went through periods of time in which he took up yoga, meditated, trained horses. His discography grew in recent years, with recordings made within the last decade of Nielsen, Lalo and Sibelius concertos. Denver violin maker Rick Molzer was a teen-age apprentice at his grandfather August Molzer's basement violin shop when he first met Fodor, who was then 15. “My grandfather said, 'Ricky, you might want to be upstairs, so you can hear him play,'” Molzer recalled. “I still remember the first note I heard Eugene play.” It was a low A, the beginning of the Glazunov Violin Concerto. “Of course, we were all blown away by his playing.” Years later, Molzer became caretaker for Fodor's instruments, which over the years have included Stradivaris, Guarneris and many fine bows. Fodor's teachers included Harold Wippler, Jascha Heifetz and Josef Gingold. Fodor had few students, but one of them was violinist William Wolcott of Omaha, Neb., who studied with Fodor in the mid-90s. Paganini – who wrote music that many violinists would classify as 'near-impossible' – was always one of Fodor's specialties, and he vigorously challenged those who would dismiss the music of Paganini as lacking substance. His reverence for this composer and violinist was evident both in his approach to the works and in an excellent essay he wrote for the 1999 occasion on which he actually played Paganini's own 1742 Guarneri del Gesu (il Cannone), a rare concert of this nature that took place in San Francisco. In a nutshell: Paganini is so hard to play, that many performers bend the music in order to meet its technical demands. That distortion is what keeps listeners from getting to the core of Paganini's music and appreciating its depth. Fodor didn't distort rhythm to accommodate technique; he didn't have to. He was still in full possession of his musical powers as recently as 2008, when I saw what must have been one of Fodor's final recitals, a benefit for the San Diego Youth Symphony at Westgate Hotel in downtown San Diego. He performed Paganini's “La Campanella” with a buoyancy both in his being and in his playing. Fodor grinned mischievously as he easily tossed off the lefthand pizzicato, fingered harmonics, perfectly in-tune octaves, ricochet and then a descending trill at the end, which left his audience gasping. His natural ease and technique seemed to defy physics. His technique did not appear to be honed from the brow-beating of any teacher; it was self-possessed, pure joy. That same kind of joy was evident when we spoke, the day after the performance. Among other things, we talked about one of the most revered works in the violin repertoire, the Chaconne from Bach's D minor partita, which he had played the night before. Besides his sister, Deborah, Fodor is survived by his brother, John Fodor; children, Dylan, Daniella and Lindsay Davis; and grandchildren, Dylan and Christopher. I found out this morning through a colleague of Mr. Fodor's passing. It shocked me greatly because he was one of my inspirations during my preparatory years. Many classmates did not know of him, but I at 12, I discovered in the library his LP of virtuoso pieces where he gives, in my opinion, the best version of Vitali's Chaconne, only comparable to Heifetz. I had a lot of fun speaking to him over the phone from New York about violins. He was so enthusiastic to speak about Strads and Guarneris and we could go on for hours. I was able to speak about the Chaccone recording with him, and express my great admiration. He will be missed among those that got to know and appreciate his talent and musicianship. Thank you Laurie for the entry. May you rest in piece Maestro. What a terrible shame to go so young.I only saw him in the film playing the Cannon violin recently . Your Perry Como video shows a wonderful intensity of sound.I used to love the Perry Como shows too.Wish I`d seen him earlier.A great artist. Wow, that is sad. Fodor's recording of the Tchaikovsky violin concerto was also one of first recordings--if not the first recording-- of the piece I ever heard. I got it from the library, it may have been a cassette too, or maybe it was vinyl. I'd never heard of him before, but in his picture he looked young and cool, kind of like a rock star. What a shame. How sad, and what a shock. This is a lovely tribute, Laurie. Yes, a lovely tribute, Laurie, and yes, sad news. : ( He was too young. I confess, I'm just very sad. He played so well, and he was in such fine form when I saw him perform just a few years ago. Are the two audience people they zoom on his parents? The elder man and the woman in the blue dress look so much like if they could be them. I was quite stunned to hear of Eugene’s passing away this morning. When he came to South Africa on one of his tours he stayed with me and I have fond memories of us walking for several hours in the surrounding mountains. Eugene was remarkably fit and I could not keep up with his pace! It was certainly one of the highlights of my violin making career listening to him practice (6 hours a day) on his fine Del Gesu Guarneri violin! I recall asking him why he still needed to practice for so many hours and his reply was that anything less he would lose having total control of the nuances of violin playing ... he also had really high string heights above the fingerboard and that way it gave him the chance of adjusting the color of sound by the pressure of his left hand and he said the extra height gave him the resistance to do that. My meeting with him was the turning point of my violin making career and he encouraged me to make higher arched instruments which I have done ever since and doing that in relation to my thickness system has certainly gone a long way to producing sweeter sounding instruments which has stood me in good stead when making the Quartet of Peace instruments. Thank you Eugene ... may you rest in peace. Thank you for this Laurie. It got me looking through Fodor's videos on UTube - and I came accross the news article on his famous performance using Paganini's 'Canon'. What a terrible loss. This is shocking news. Gene was an old friend of mine. He was staying at my apartment in New York when he was mugged on the way to a concert in 1982. He was personally difficult and yet was very charming. I had lost touch with him but always felt warmly about him. So young to leave us. I love the personal tributes members are posting here, as well. They are touching and so interesting, and a lovely way to honor Mr. Fodor. Thanks, all of you, for taking the time to share your memories of experiences with him. They're very special to read. I am shocked to say the least. I met Eugene in 2008 when he came to Cremona to play a solo recital. He played the Bach Chaconne at my stand at the Mondomusica Fair, attracting a great crowd. The day after I took him to the airport. Farewell, Eugene, I truly hope you've found the peace you were searching for. He was a brilliant violinist! It's so sad that he was taken from us so young. RIP, Eugene! I got to know him in the 60's at Meadowmount, Galamian's summer practice camp. He was a really nice and approachable person and was a great player. He had a very carefree attitude. I think everything went wrong when he went to NYC to study. He just got involved with the freedom he felt there and got into drugs, which took over his life. At that time, there was little help available for this type of problem and he was left out on a limb. Also, the people marketing him tried to create a special outwest, cowboy image, which really was not him, in my opinion. His brother who I got to know in NY, by the way is also a great violinist, but didn't get the exposure Gene did. I am shocked and sad. Eugene was always very supportive. While looking through our E-mail correspondence yesterday, I found notes like “I would be happy to play a charity concert for no fee”. Eugene was a passionate outdoor guy.“Going riding soon in one of my favorite canyons-the North Fork of the South Platte-a roaring river runs through it-and there is no one to be found for miles around. Galloping is best-leading one and ponieing the other-rotating the two on each ride. I feel like a rich red man when I do that“. I was also reminded that Eugene nearly joined my friends and me on the Machu Picchu/Galapagos trip 2009. Only one flight connection on his concert schedule stopped him to do so. We joked about Eugene playing on his del Gesù at the top of Huayna Picchu. A great violinist has left us. The glory of his name and musicianship will forever be connected to his favourite violins ex-Fodor Guarneri del Gesù anno1740, ex-Smith Antonio Stradivari anno 1727 and the ex-Kingman Giovanni Battista Guadagnini, anno 1769. We are many who will remember and miss him. Thank you Laurie for the great tribute. My favorite Eugene Fodor moment is when he was the special guest on Second City Television from Canada. He was playing a promising concert violinist who was corrupted by a Joan Crawford type gangster moll character played by Catherine O'Hara. She was wearing impossibly huge shoulder pads. I think that the late John Candy was a mob boss and rival for Catherine O'Hara's affections. How many touring virtuoso concert violinists at the height of their career would agree to appear on Second City? Only Eugene Fodor! We laughed until we hurt! I was at Meadowmount in the summers of 1967-69. At one of the weekly performances I remember Eugene playing...... he changed a whole bunch of fingerings and bowings while performing, and Galamian was ready to shoot him afterward! It was very daring, and I think that many of us admired him for it. The two big rules ("don't peel the bark off the birch trees," and "stay out of the bushes") were nothing compared to this audacious act! I remember his performance as absolutely electric, with a personality bigger than life. He was truly amazing, and I feel privileged to have experienced his performances in his teen years.